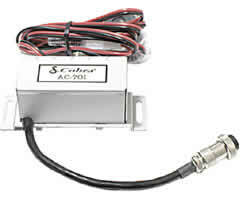 Add a junction box to a second auto and transferring the radio is quick and easy. The hand held portion of the Cobra 75 attaches to this junction box. The junction box connects to the antenna coax and the auto's electrical system. The junction box also has an external speaker jack in the event an additional speaker is desired.